Your reputation is the core of your business. In this day and age of 24/7 news and easy access to online data, it has become more important than ever that you have a plan on how to manage your business reputation online. There are numberless review sites and social media shops that permit anyone to mention something regarding your business. IRVING SCHEIB HELP YOU DEFEND AND INCREASE YOUR REPUTATION ONLINE! Irving Scheib can help! We have a two-part process to help you manage your online reviews/reputation. We have 2 services to help in ensuring your on-line reputation stays nice and shiny! We have a review platform that takes help week out negative reviews, giving you a chance to address a customer’s concerns before they go out and leave a negative review for you online. On the other side of that coin, our system directs people that have a positive view of their experience and your business to leave a review where it has the biggest impact for you online. 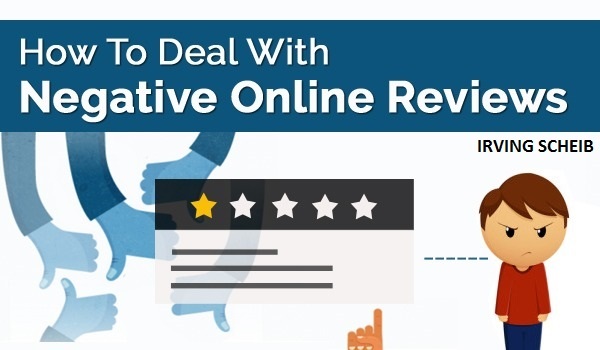 We manually reply to all negative and positive reviews left for your business on-line. We also take the best reviews you receive and put them into a very beautiful graphic that we share on your social profiles for you if we are managing your social media for you as well.